Knitting Nesting Instincts - Kellbot! | Kellbot! I actually started knitting baby items well before I got pregnant myself. Baby items are some of the most satisfying things to knit: they’re quick, they’re great for using up the odds and ends in your yarn stash, and the fit can be pretty haphazard. 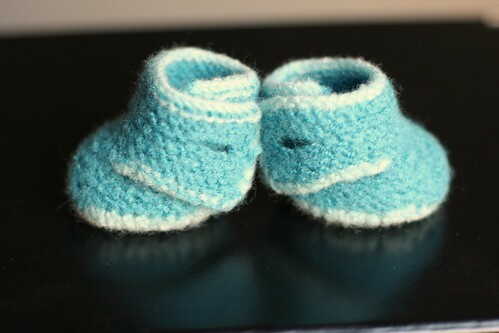 When my friend Bre’s baby was born I knit a tiny pair of baby booties, which immediately triggered a flood of suspicion from the family. The pattern can be purchased here. 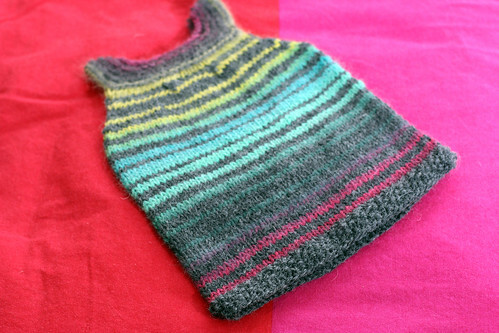 Next up was a tunic/dress thing for our own spawn. I had half a ball of Chroma yarn left, which tends to look a little like clown vomit when used by itself, so I striped it with some grey. It didn’t come out nearly as well as I’d hoped, mostly because the varigated yarn competes too much with the cable details, so I didn’t bother to photograph it. I keep track of my knitting on Ravelry, you can follow me there if you’re a knitter too.